It’s a scenario seen all the time with youth riders – they’re ready to graduate to a serious off-road bike, yet they’re still too small for a bike like the CRF100F. Enter the CRF80F. With big-bike performance features like a manual clutch and a five-speed gearbox, in addition to ruggedly reliable four-stroke power, the CRF80F is simply further proof that Honda’s off-road line-up has a machine for every step along a young rider’s learning curve. 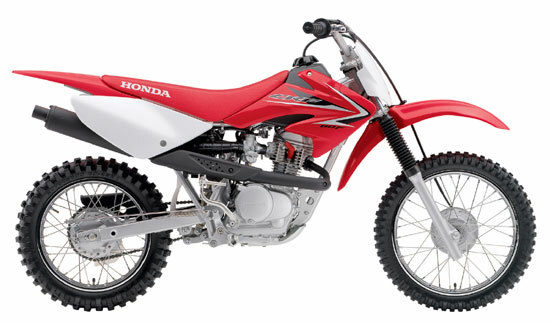 The CRF80F features Honda’s legendary reliability, big-bike styling, nimble handling and wonderfully balanced performance. It’s the perfect match for young riders ready to step up to a manual clutch machine. – Durable, proven and simple 80cc air-cooled single-cylinder four-stroke engine develops smooth, tractable power that’s ideal for beginners. – Ultra-reliable CD ignition never needs maintenance. – 20mm carburetor for crisp throttle response. – Closed crankcase vent system safeguards against engine oil contamination. – Primary kickstarting for easy starts in any gear. – Lightweight, upswept competition-type exhaust system utilizes a quiet, USDA-qualified muffler/spark arrester. – Durable, smooth-shifting five-speed transmission. – Heavy-duty clutch with smooth, progressive engagement. – Lightweight high-tensile steel frame is rigid, durable and offers ideal geometry for recreational off-roading. – Leading-axle 27mm Showa front fork offers 5.5 inches of compliant suspension travel. – Heavy-duty Showa rear shock offers a smooth ride. – Knobby tires offer excellent grip and long life. – Lightweight screw-type drive chain adjusters for simple maintenance. – Powerful, lightweight drum brakes. – Engine design produces low emissions that meets both EPA and California Air Resources Board (CARB) off-road emissions standards. – Keyed ignition switch provides added security. – CRF-style seat shape accommodates a broad range of rider sizes. – Generous ground clearance and rugged skidplate for undercarriage protection. – CRF-shape handlebar enhances rider comfort. – High-quality controls feature comfortable grips, dogleg levers and side-pull throttle just like those of the bigger CRFs. – Cleated, folding, self-cleaning footpegs offer secure footing. – Fork boots help protect stanchion tubes and fork seals. – Silver-painted frame and footpegs. – Washable, reusable foam air filter. Transferable six-month limited warranty; extended warranty available with a Honda Protection Plan. When you buy a new Honda Powersports Product, you may be eligible to receive a complimentary one year membership in the Honda Riders Club of America®, which includes an exclusive Members-only magazine, rider training benefits, access to the Members-only Clubhouse Web site and much more. Some limitations apply. For more information on the HRCA®, log on to hrca.honda.com.